Last night, Joanne organized a wonderful sort-of seder for the three of us by Skype, or I should say four since Tanya was with Walter in Montclair while Joanne was with me in my dining room in Piedmont. She had decided a few days ago to call off her planned full seder, and instead instigated an family video powwow over wine and matzoh to discuss the recent developments regarding the citizenship question. We learned much on that score and as the evening developed shared even more surprises. I will leave it at that for now and encourage both Walter and Joanne to post their thoughts. Meanwhile, this post is on a related tangent and grows out of last night's meeting. I was sharing the various birth and death records that I have in my collection for members of my mother's family, the very documents that will substantiate our claims (if we proceed with them) to birthright German citizenship. Most importantly, I showed our mother's birth certificate showing her October 1924 birth to German parents in a Berlin hospital. 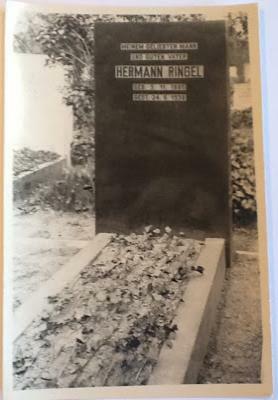 I also showed the 1888 birth and 1938 death certificate for her father Hermann Ringel, and the 1921 death certificate of Hermann's mother Feigla Ringel nee Kaufler. And there were more items among the collection. My own original 1952 birth certificate was in a file drawer. By now, people's eyes were glazing over and we didn't look closely at the items in the drawer with items about Elly Ringel, Hermann's wife, Helga's mother, the grandmother we knew as Ogi. Later after the call, Jo and I looked at those items, including her amazing refugee travel documents and photos in a worn leather pouch that she carried with her on long journey to America. All this was familiar to us from our earlier discovery of this material. The photos included headstones from the Weissensee Cemetery in Berlin for Hermann Ringel and for two Wohlgemuth family members, Isaak and Rose. Here they are (sorry for the quality, these are quick iPad snaps while my scanner is out of commission). Joanne who had been in Berlin and visited Hermann's grave several years ago, looked hard at the photo and said that it looks just as it does now. 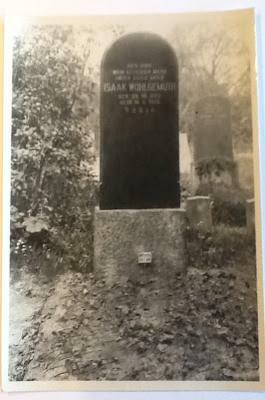 Then she said that at the time she wondered who had arranged for the headstone, since under ordinary Jewish custom that would not have been placed until his first jahrzeit, anniversary of his death. From our mom we knew that Elly and Helga fled Berlin three months after Hermann's death. And now Joanne is realizing that the photo she is holding was taken in 1938 between the time of Hermann's death and Elly's flight from Germany. So now she has the answer to her earlier question, that under the emergency circumstances of the time ordinary religious customs were sidestepped. Then we turned our attention to Elly's death certificate, issued October 4, 1981 in Santa Clara County, California. When I looked at this document that I had studied several years earlier (it was the source of our knowledge of Elly's mother's name, Betty Katz) I suddenly realized that I have been mistaken for the last years of my research about Elly's father's name. 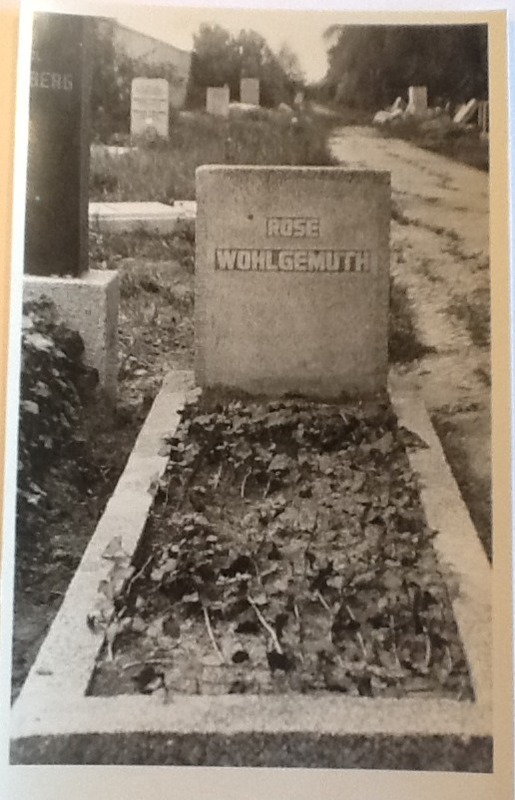 It is not, as I have written in this blog and posted in my family tree, and as Walter transcribed Helga's account in his family narrative, it is not Julius Wohlgemuth. It is Isaac Wohlgemuth. It says it right there on Elly's death certificate. And that's why she is carries headstone photos for Isaak and Rose Wohlgemuth, but nothing for Julius. Doh. Earlier in this adventure, Walter described his Alex Haley moment of discovery. Well, this must be our Homer Simpson moment. A stupid mistake. For years, I have been looking for Julius Wohlgemuth, constantly stumbling over several other worthies by that name, including a well known biochemist who worked in Berlin and published an important text in 1913. It was the name Julius that led me to my hypothesis that our Wohlgemuths might have come from the town of Angerberg in East Prussia (now Wegorzewo in Poland). I haven't yet spoken with Walter since realizing our error, but we'll have to reconstruct where we went wrong. There is another Julius on our father's side in our story. And I was finding these tidbits on Juliuses in the records. At this point, I'm thinking Elly's father Isaac, spelled Isaak on the gravestone, had just one sibling, Rose, and there is no Julius at all. So now I've started looking for Isaac and have some preliminary things to report in the next post.